Curtis Cook, the 24-year-old organist for the Buffalo Sabres. Curtis Cook is a 24-year-old living his childhood dream. 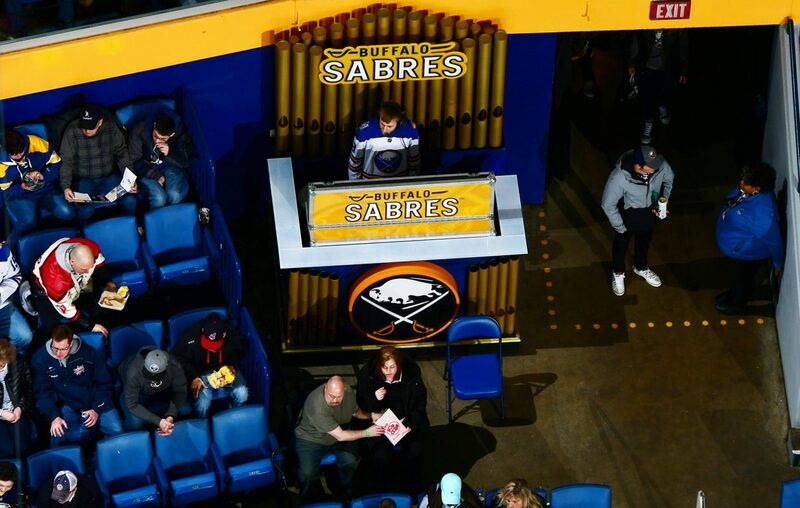 After growing up a Sabres fan, he became the team’s organist in 2016 and now gets to live out his sports-fan fantasies as part of the Sabres game day presentation. Grew up in East Amherst, now live in Getzville. I went to Williamsville North. What do you do for work outside the Sabres? I am a church organist for two different churches and an adjunct instructor of music at Niagara County Community College. I’m also the organist at Shea’s. How’d you get started playing? I started in church. When I was 15 I got my first church job and I thought the organ was kind of cool. It seemed like a piano on steroids. How did you start with the Sabres? When I was in college I was working for a car dealership and one of the service managers asked if I played the organ. He knew someone down at the arena, and said 'why don’t you give me your card and I’ll pass it along—maybe someday you’ll be playing for Sabres games.' I just sort of rolled my eyes and laughed, but I gave him my card. The summer of 2016 I got an email from my current boss at the Sabres. What’s the difference between a piano and an organ? A piano has 88 keys that are weighted, you have one single keyboard and a sustain pedal. The organ was designed to be an orchestra in a box. There’s more than one keyboard, they aren’t weighted and they have 61 keys on each keyboard. There’s also a pedalboard that is pretty much a giant keyboard for your feet. A big part of the job is being able to read the crowd and help capture the crowd’s emotions: whether you’re going to play something fast, something a little slower or a crowd interaction chant. You have to be a fan yourself and feel the action on the ice and be in the crowd to pick what you should play. Do you watch road games on your off nights? Absolutely, I’ve been watching ever since I was a kid. When I was little, I used to go to bed at 7:30 or 8 p.m., but on game days my dad would let me stay up a little later to watch the end of the first period. Where did you get your signature yellow jacket? That was the brainchild of our game presentation staff. After my first season, they went to Nashville to see a playoff game and I got a text with a picture of these crazy blue-and-gold checked golf pants they found at the Predators store. They asked, 'Would you wear these?' I said not in public—but if I would wear them in the arena. Later on they wanted to make me more of a personality—give me some suits, put me on the Jumbotron, make me more a part of the game. I’ve got a yellow one, a blue one, a holiday one, a special one of New Years Eve, one for Hockey Fights Cancer night…my closet is full of crazy colors. What are your favorite game day memories? The first preseason game I played for was always going to stick in my head. Last year we had the World Juniors here, and I played for a lot of those games, including the one outside. I thought I would be under something, but I was out in the open right on the sideline. It was a nice day before the game, but about five minutes in, the snow started to come down. It slowly got harder and harder so DJ Milk and DJ Yes were running around finding me rags and canned air to blow snow off the organ. It was a very memorable game. Well I’m self taught, I didn’t start taking lessons until I was in college. It sort of was an on-and-off thing for me growing up, and I really started to get into it around 10. By the time I was 13, I was playing out professionally and at 15 I got my first job in church. I started playing piano then moved onto organ. Where are you located in the arena? In between section 120 and 121, so I’m in full view and fully unprotected from Toronto fans throwing beer at me or something like that. Do you have any favorite tunes? I don’t know if I have a lot of favorites, but a lot of people tell me that Subdivisions by Rush is one of their favorites. I get a lot of requests for it on Twitter. The old Sabres theme songs like “Rock Em Sabres,” which was the theme song in the '80s. Sometimes I’ll play the old Empire Sports Network intro music. To me, when I was growing up when you heard that music it was time for hockey.